Today, we’re going to cover the “technology” part of the DIY: dealing with your Instagram images and ordering your fabric. You can do this in a few different ways. Some of you may already regularly download your Instagram photos from your phone, but if you’re lazy like me you never plug your smartphone, you need another option. Instaport is a great, free service that will let you download your Instagram photos in a matter of minutes – head over there, link up your Instagram account, and in about 5 minutes (depending on how many photos you have!) you should be all set. Extract the .zip to wherever you like, and we’re ready to go. 2. Figure out which ones you want to use! 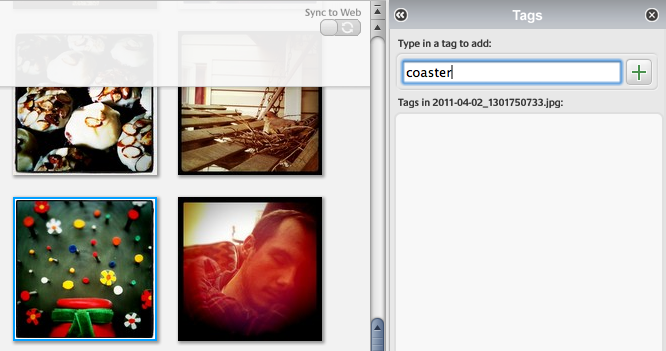 Here is the real miracle of Picasa, guys: almost instant perfectly formatted photo collages. Picasa, if you’ve never used it before, is going to make some random scattered collage thing – which is cool and all, but we need everything neatly arranged in a grid to create our fabric. Picasa automatically saves your image to Images/Picasa/Collages – use File > Save As if you’d like to make another copy somewhere else. This part is much easier, I promise! Once you log into Spoonflower, just click Create > Custom Fabric to start. 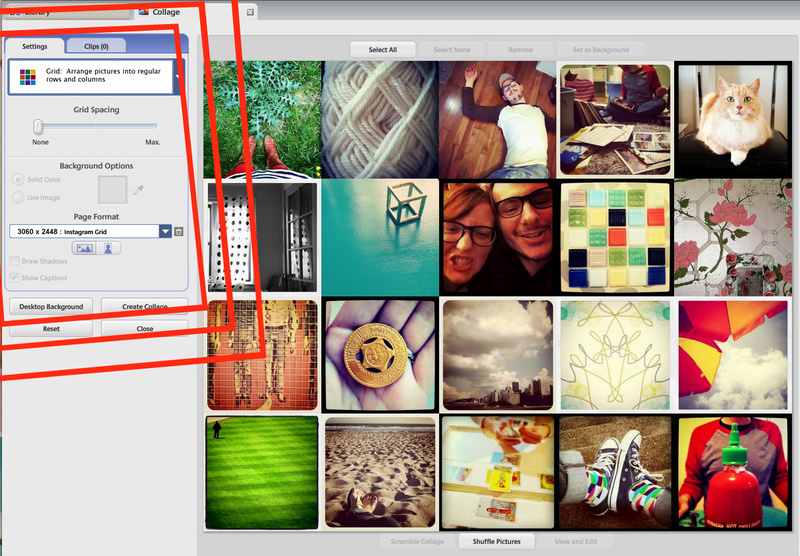 Select your file and click the “Upload File” button. I used the Heavy Cotton Twill for my coasters, but I imagine the Linen Cotten Canvas would also work well (and is a few dollars cheaper). I do not recommend any of the other lighter-weight fabrics for these coasters, but they might be really great for other projects! Make sure you select a Fat Quarter size – you will not need a full yard. If you’re only making 4 coasters, here you can select a Test Swatch instead. This next bit is really important! Change your DPI from 150 pixels per inch to 255 pixels per inch; this will make your images almost exactly 4 inches square. 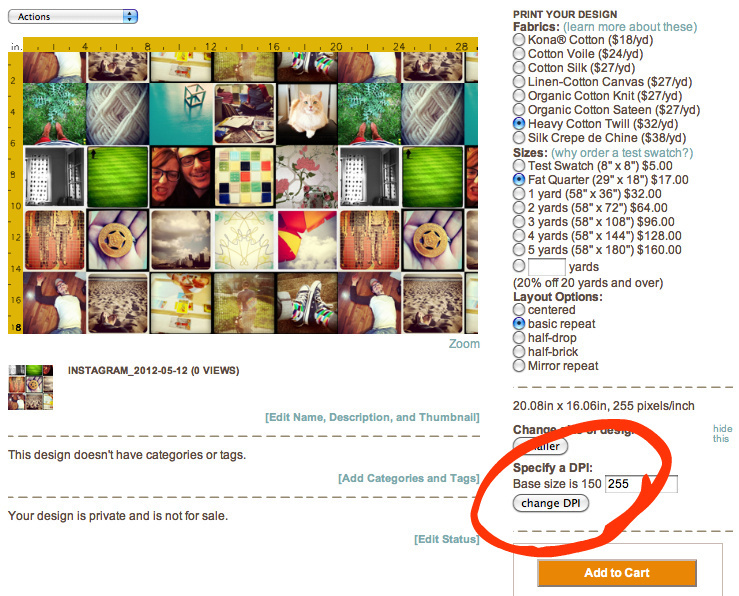 Spoonflower displays a little ruler on your image so you can check to make sure your images are near the 4 inch mark. If you miss this step, you’ll end up with each Instagram image being printed at about 6.5 inches each – way too big for this project! Eagle-eyed readers will note that I actually only used 20 images, not 28! This means two columns of my original file are duplicated on my fabric. I wanted some extras in case I screwed up, but I ended up not needing them at all. Click “Add to Cart” and go ahead and checkout. Now comes the really hard part: waiting for your fabric to be delivered! Assuming you don’t choose a rush option, this can take 1.5 – 2 weeks normally. Rather than wait that long, I’m going to pick back up with Part 2: Assembly tomorrow – that way you can make sure you have everything you need ready to go before your fabric arrives.